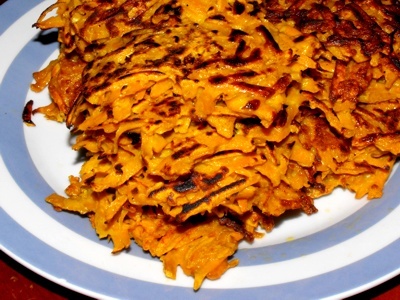 These sweet potato pancakes are a pleasant twist on the common pancake recipe. They are delicious on their own or as an accompaniment to a dish of your choice. They may be served sweet or savoury allowing for a wide range of toppings. Submit your pancake or topping recipe! Peel and grate the sweet potatoes. The finer the sweet potatoes are grated the more consistent the batter becomes. Mix all of the dry ingredients, one cup of flour, one teaspoon of baking powder, the four teaspoons of sugar and the spices together. There are also three teaspoons of curry and two teaspoons of cumin to add. Break the three eggs into a separate bowl and beat them lightly with the 1/2 cup of milk before pouring the mix over the grated sweet potatoes. Dust the dry mix of ingredients over the sweet potatoes gradually while stirring the mixture. Grease the pan lightly with oil. Keep the pan at a low but steady heat and spoon the batter in two or three (whatever works best for you) heaps into the hot pan smooth the batter with the spoon. Turn them once they are lightly browned with a spatula. When done pile them on a plate. Reduce the heat if you feel like the pancakes are burning. Repeat the step five until done. You can eat them like they are or top them with one of your favourite toppings. Last time we tried a dip made out of sour cream and parsley pesto which complemented them nicely. Do you have a serving suggestion with the sweet potato pancakes? Drop EasyHealthyRecipesForKids.com a note and we will add it. We often make one of the soup recipes below with it. Click the thumbnail and get the recipe.